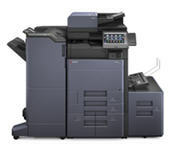 United Business Machines has been serving the Laser Printer and Copier needs of New Hampshire and Northern Mass. since 1985. Our professional staff will work to find the very best solution to your office equipment needs. From expert maintenance and repair to friendly consultation and advice, we're just a phone call away. Our goal is to have your office running as efficiently and cost effectively as possible. We are partnered with the leading suppliers of technology in the industry - Ricoh, Sharp, Canon, HP, KIP and Riso. This partnering coupled with our in house expertise means we can bring you the latest in technology at an affordable price.